Coming up we’ll hear from Frank Holmes, CEO of U.S. Global Investors and author of the book The Goldwatcher: Demystifying Gold Investing. Frank tells us where he thinks gold is headed in the near term, gives us a 2017 outlook for the metals and tells us why he believes the next 100 days will be very key in the financial markets. 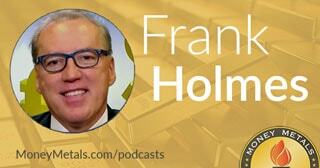 Don’t miss another great interview with Frank Holmes, coming up after this week’s market update. Precious metals markets started off the New Year with a bang. After showing some life last week, the metals complex raced higher in the first trading days of 2017, led by the mining stocks. The HUI gold miners index registered a gain of 12% this week through Thursday’s close. As for gold itself, spot prices currently come in $20 higher for the second straight week at $1,174 an ounce to post a 1.7% advance on the week as of this Friday recording. Silver is up 2.7% this week to trade at $16.47 per ounce. But the big winners so far in the early goings of 2017 are platinum and palladium. Platinum checks in this week with a 7.0% advance to bring prices to $969 an ounce. Meanwhile, palladium now trades at $755 after gaining a whopping $72 or 10.5% so far this week and this year. Traders who were looking for a New Year plunge in markets have certainly been disappointed. It hasn’t paid this week to be bearish on metals, bonds, or stocks. About the only good place to be short is the U.S. dollar. The Dollar Index dropped 1% this week. The Greenback was hurt by Wednesday’s release of the Federal Reserve’s latest meeting chatter. Fed officials telegraphed a “gradual” pace of rate increases. However, some policymakers expressed concern about potential risks in the economy that could cause the central bank to change course. Fed officials are also concerned about the new political environment they will face. Senator Rand Paul wasted no time in reintroducing his Federal Reserve Transparency Act as Congress went into session on Tuesday. The Act, which is also known as the Audit the Fed bill, has the support of president-elect Donald Trump. Auditing the Fed would be an important step in reforming the monetary system. But it’s up to Congress and the incoming administration to get Washington’s fiscal house in order. Toward that end, Senator Paul took to the Senate floor to berate his fellow Republicans over their plans to add a mountain of new debt. Sen. Rand Paul: The national debt went from five trillion to $10 trillion under George W. Bush, and then it doubled again under President Obama. It went from 10 to nearly 20. And what are we looking at here? More debt. The more things change, the more they seem to stay the same. Republicans won the White House. Republicans control the Senate. Republicans control the House. And what will the first order of business be for the new Republican majority? To pass a budget that never balances. To pass a budget that will add 9.7 trillion dollars of new debt over 10 years. On Thursday, the Commodity Futures Trading Commission announced that former New Jersey Governor and MF Global CEO Jon Corzine will pay $5 million to end litigation over his role in his bankrupt firm’s malfeasance. MF Global went bust in 2011 after taking on leveraged positions in Greek and other European bonds that subsequently tanked in value. MF Global had illegally tapped into nearly a billion dollars in customer funds to ramp up its speculative bets on European debt. Among the MF Global clients who unwittingly financed Corzine’s bad bets were those who held allocated physical gold accounts. Or at least, that’s what they thought they held. In reality, MF Global had pooled all the gold assets held by customers together and treated the gold as an asset of the firm. When the firm declared bankruptcy, clients who thought they owned specific quantities of gold stored in a vault on their behalf found out that they didn’t. They couldn’t access or sell their gold because it was all in MF Global’s name. The MF Global debacle serves as a lesson for investors who want to own physical precious metals as a way of diversifying out of the financial system. Don’t hold precious metals within an account at a brokerage firm or bank. Hold at least some significant quantity of metals in a home safe where you can gain access to them immediately at any time. You never know when you might need them in an emergency. That said, there are risks to keeping valuable tangible assets at home. Burglary is chief among them. If you have a large holding, it makes sense to keep some of it in a secure vault that has far stronger and more sophisticated anti-theft systems in place than you ever could have inside your home. When it comes to physical security, a professional vaulting service such as Money Metals Depository cannot be matched. Our facilities offer armed guards, Class 3 vaults, multiple perimeters, state-of-the-art electronic security, dual controls, and fully segregated storage. No MF Global style schemes with pooled accounts. Perhaps most importantly, you get insurance coverage for your entire holding. Holders of safe deposit boxes at banks are often surprised to learn that the contents of their box are not insured. Worse, banks have a history of working with regulators and may well be complicit in any government scheme to declare a bank holiday, a “bail-in” or the confiscation of assets. Owning physical gold and silver with Money Metals Depository gives you the convenience of not having to take delivery of your bullion or send it anywhere when you want to sell. You can also open a precious metals IRA account that consists of eligible coins, rounds, or bars stored in a secure vault on your behalf. To learn more about precious metals IRAs and other options for our surprising affordable secure bullion storage, call one of our specialists at 1-800-800-1865. Mike Gleason: We are fortunate today to be joined by Frank Holmes, CEO and Chief Investment Officer at U.S. Global Investors. Just recently Mr. Holmes received another award from the Mining Journal and was named America's Best Fund Manager for 2016, one of many awards he's received now in the mining industry for his fantastic track record. He is also the co-author of the book The Gold Watcher: Demystifying Gold Investing and is a regular guest on CNBC, Bloomberg, Fox Business, as well as right here on the Money Metals Podcast. Frank Happy New Year to you and it's great to have you back with us and thanks for joining us again. Frank Holmes: It's good to be with you all and yes, Happy New Year and wishing everyone buckets of laughter and gold this year. Mike Gleason: Well to start out here, we'll talk about gold specifically and I want to get your comments from a technical analysis standpoint in the gold market as we begin the new year. I know you're pretty optimistic about where prices may be headed saying that gold was significantly oversold at the end of the year. You wrote a great piece recently for your website on the subject. So, if you would please share with our listeners why you're looking for a reversal and a move higher in the metals. Frank Holmes: One of the things we like to do is try and remove the emotions of markets and apply some basic statistical analysis. One of the most simple ones is the oscillator and it's looking at the rate of change over a specific time period. In 60 trading days which we published on and that's looking over a basically 90 calendar days which is a quarter. You go back over 10 years, 20 years, and it doesn't matter if gold was in a micro-rising trend or a falling trend, things will overshoot both to the upside and to the downside. There are these extreme pivot points that investors should look at and what we've seen here is that gold is down two standard deviations. That's just forecasted over the next 60 trading days, the odds are they have a 90% of a probability of a reversal back to the mean. It also comes at year end and usually gold rallies in January going into the Chinese New Year, so it appears that we start this rally. Mike Gleason: Yeah we're certainly looking good here as we're speaking on Wednesday of this week. The first week of the year does appear to be positive for metals which of course is a nice sign for many folks who've been worn out over the last few months with the price action. On one of the fundamental drivers you watch carefully when it comes to the precious metals is real interest rates. We've talked about that a lot with you. All other factors aside higher real interest rates tend to weigh on gold prices because gold doesn't generate a yield. We've seen yields move higher since November and that is one of the factors weighing on the metals. We have the Fed targeting three to four rate hikes in 2017 but we know that what they say and what they do are often two very different things. Last year at this time, Janet Yellen was telegraphing four hikes and delivered one and that was in the final month of the year. So what is your outlook for interest rates in 2017? Frank Holmes: I think that they backed up very quickly and I think that we're going to have inflation. Historically whenever you have such a big fiscal stimulus and it's very demand focused domestically, domestic demand, and we've this short in the small cap stock arena, then the odds favor that inflation will be higher. Here the magic is, how high can rates stay ahead of inflation without stifling a recession? And I don't think they can go much higher, and I think that's the inflection point. Right now if you take a look at the spike in the short two year government bond, which most currencies trade off of, you see an extra 80 bases points – an unexpected rally in that yield. And that would have basically on a debt rollover take the debt servicing up to 3.5% of GDP. So, I think that that would be fragile to say the least. I think the other things where investors need to recognize is that if Trump does go with his tariffs and doing all this stuff, some of these thoughts are out there, this will trigger inflation and we're going to see gold participate in a big rally. The last thing I want to share with the investors was that this time last year when everyone was so bearish and bleak and gold started this rally. The gold stocks that cleansed all themselves to balance sheet and started on a spectacular run. When they were up 40% most of Wall Street was telling me, "Oh, it’s up too high." I would do interviews and it's up 80% and, "Oh that's up way too high." Now, our funds are up 100%, "That's just impossible." And still we're up, or gold (stocks) were up 70% I think for the past year and that was still too high. We still have this per base of negativity towards gold and talking down gold as an asset class. I think that that's another factor that lends itself that we can get this surge of short covering in gold stocks. Mike Gleason: Leading me right into my next question. Last year was a real rollercoaster for the mining industry. You obviously follow that sector very closely, so will 2017 look more like the first half of 2016 for the miners where they ascended rapidly and the environment was very positive? Or will it look like the second half of the year when they pulled back and gave back much of those gains? Basically how are things setting up for the mining sector this year? Frank Holmes: It's a good question. When you do time series analysis that is, what is the core relation over 20 trading days between gold and the gold stocks? We're talking about a 95% core relation. So if you want to understand the gold stocks you really have to understand the price the gold and where the direction it’s going. Our forecast in gold stocks most times is a forecast on gold. What the difference is currencies and right now the cheapest gold stocks in the world on an operating cash flow enterprise value are populating in South Africa and Australia. If you take a look at to the multiples as compared to North America and if you look at just having a basket of those names last year and rebalancing them and being a scavenger even though the gold rally was taking place, buying the cheapest operating cash flow to enterprise value, you far outperformed everything, the top 10 names. In running a mutual fund we have to have at least 21 names and it ends up being more. Coming back from the thought process, I think you need rally in gold, we're going to see those countries where their currency is weak so therefore labor costs are weaker but they're getting U.S. dollars even if the dollar is stronger and gold prices and U.S. dollars, they have a margin expansion. Mike Gleason: Speaking of the currencies obviously one of the major headwinds for gold over the last several months has been the strong U.S. dollar. What are you looking for there in the currencies? Is the dollar likely to weaken versus the other fiat currencies around the world? And how does that weigh in on the Fed's policy as well? Frank Holmes: I think the next 100 days it's going to be very important. One thing about Trump, he is taking speed as being a very important factor in how he's looking at capital markets. So,I think we'll have a better feel in the first 100 days. Mike Gleason: The Deutsche Bank market rigging case has been in the news recently. What are your thoughts there Frank? Will we finally get somewhere with this manipulation thing this time? What we're reading related to this case is pretty damning and the rigging was pretty blatant. Frank Holmes: Yeah, it really is. But I think we need to remember is that there's some relationship with the Fed and these banks. They're taking it on the chin. Deutsche Bank has been beaten up everywhere, accused for everything and when I went to go back for a tax rebate, the IRS came back and went back to the year 2000 to say they didn't reclaim properly some private companies that they had invested in. It appears that no matter what they do the Washington DC is going after Deutsche Bank. So it could be from gold, it could be for mortgages. It could be for anything that they've done from LIBOR, et cetera. But I do think what it's showing you is that they recognize that the gold future's market is leveraged sometimes 25 to one. And it doesn't take much money to knock the price of gold around especially if there's a Chinese holiday and trigger stop losses and push gold all around within the future's market until all of a sudden the cash market opens. So, I think that that exposes that between all the banks of how they can play games with the future's market around the physical market. Mike Gleason: How serious do think manipulation is specifically in the metals market Frank? Do you believe this will lead to a meaningful impact on the price as more comes to light and some of the perpetrators get punished? Frank Holmes: I think it's always going to happen. It's a matter of how you get it exposed is key. And I think that there's more and more sophisticated technical tools that people are using and looking for fund flows to better engage it. But in the beginning of October 2016 in the first week when China was closed and is now the biggest gold bullion buyer in the world and has now become the gold price maker not the taker, it was a fragile-like market and the future's market hit all these stop losses. I think there will always be guys out there playing that game. And you just have to recognize that if there's a holiday coming up, a major holiday in China then you can expect that's time when gold can be played with. I think that that's just a reality. I think that the governments all try to manipulate interest rates so they can borrow cheaply and deploy capital for their own government programs and all the employees they hire. So, I think that you're always going to deal with this and part of investing is almost, dust off the book, The Art of War by Sun Tzu and where he says, "Strategy without tactics is the slowest route to victory and tactics without strategy is a noise before defeat." So, make sure that you've got a strategy and tactics and that you understand gold markets and when they're more liquid then not. Mike Gleason: Yeah, very good advice and a great book as well. Getting back to the miners a little bit I just want to talk about some of the supply-demand situation here. We've got lower prices again. Is the mining industry going to maybe consolidate a little bit? Are we going to see less supply coming online as result, less exploration? What do you think there? What kind of impact do you see that having on price and maybe putting in a price floor if we have supply really dwindling? Frank Holmes: I think I wrote a book and gave some charts in my recent Frank Talk. It looks like they're calling 2019 as a peak for the gold because there's been a massive cut back in the past five years of exploration. Each year it just makes it more difficult to have a discovery and bring something on stream. The process from discovery to getting an ounce of gold out of the group, which use to take eight years is now pushing 20 years. I think this is a new reality and it's good to have clean air and clean water but it has become very extremely difficult to explore, to develop, and to maintain gold production. Mike Gleason: Well as we look ahead into 2017 here just being several days in at this point, what stories do you see developing that metal investors are likely to be talking about... because in 2016 the focus was on the big price rally in the first half of the year, Brexit and the Presidential election. In the months ahead we'll find out something about what Trump can actually deliver when he takes office. Meanwhile it looks like trouble is still brewing for the establishment in Europe, the banking sector there doesn't look too healthy and they certainly have not resolved the debt crisis in places like Greece. And of course we've got the Deutsche Bank market rigging case that does as it plays out could potentially make waves in the metals markets. What are you guessing will be the big stories of 2017 Frank? Frank Holmes: Pac Man. So, this thought process that gold supply is going to be dwindling and peaking shortly. You're going to see big caps buying small caps and big caps have to merge or go after the mid-caps. I think that stocks have become undervalued. You're going to see more and more merger activity and aggressive acquisitions this year. Mike Gleason: Well, as we begin to close here Frank, anything else that you're looking for this year? What kind of year do you think it will be for investors especially those of us who focus on the metals and miners? Frank Holmes: I've always recommended 10% in bullion and gold. And they out-performed. Gold stocks far outperformed last year against the S&P 500. And gold bullion also did fairly well in a rising interest scenario. So, I think the thought process of always having 10% and re-weighting and rebalancing is just prudent for investors. And stay optimistic. MIT did a study on the significance of optimism and if you're pessimistic, you can't see opportunity as readily as other people that are optimistic. So, I think for our health both physically and financially stay optimistic. Mike Gleason: Very good advice for sure. It's always wonderful insights as usual Frank. We really enjoy hearing your thoughts and we really appreciate your time once again. Now, before we let you go, please tell our listeners a little bit more about your firm and your services if they're not yet familiar. And then also how they can follow you and your fantastic Frank Talk blog? Frank Holmes: Well, thank you that's very kind words. USfunds.com. Subscribe to the Investor Alert or Frank Talk and you'll get weekly commentaries on different commodities and the world of oil or Russia, Eastern Europe, China, et cetera, we comment on that. And we also have top world class short term muni-funds and muni yields still appear to be more attractive than buying short term government (bonds). We have a thought process that it's important to be balanced and have some munis and that's another way to play the infrastructure. So go to USfunds.com. Mike Gleason: Well, real stuff as always and really appreciate it Frank. Thanks so much. Have a great New Year and look forward to catching up with you again before long. Frank Holmes: In a 100 days. Mike Gleason: Well, that will do it for this week. Thanks again to Frank Holmes, CEO of U.S. Global Investors, the site is USfunds.com and be sure and check out the previously mentioned Frank Talk blog, some of the best market commentary you will find anywhere on gold, the miners, the commodities as a whole and many other topics related to the investment world. Again, you can find all that at USfunds.com. And check back here next Friday for our next Weekly Market Wrap Podcast. Until then this has been Mike Gleason with Money Metals Exchange. Thanks for listening and have a great weekend everybody.